i’ve discovered sausages later than most. in fact it has only been in the last year or so that uncured sausages (i’ve always been excited by salami, chorizo etc) have been things that i’ve bought, not just for someone else, but because i’ve been looking forward to cooking and eating them. ok, i did start by using them in ways that where they could be described as “disguised” but i’ve moved on. i’m now enjoying trying different types of sausages and different ways of cooking them and this dish, which sees them baked with tomatoes and fennel, is as good as it gets. as well as exploring the sausage offerings of my favourite delicatessens or butcher i’m trying marks & spencer’s range as their cumberland’s are highly praised (and always sold out!). this week we tried their “british sausages – outdoor bred pork” which, with 97% pork content and pepper, coriander and nutmeg as the seasonings, were a great success and as far away from the boring sausages of my childhood as anyone can get. on a large roasting tray, mix the fennel, onion, tomatoes, herbs and garlic. drizzle well with the olive oil and balsamic vinegar and mix together. place the sausages on top, turning them over so they are lightly coated with olive oil. season then cook for an hour, turning things over every 20 minutes or so. take the sausages off the tray and tip the vegetables and herbs into a large saucepan (this is to thicken the tomato and fennel “sauce”, you may not need to do this). 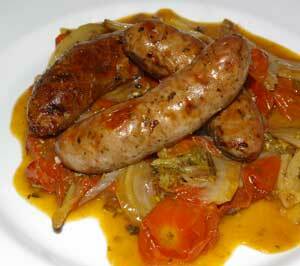 put the sausages back on the tray and return to the oven to finish browning/keep warm. heat the fennel and tomato mix, bringing it to the boil. let this bubble away until the sauce thickens to a consistency that you like. we ate this with warm ciabatta (smeared with butter for me) and a green salad. i will be making it again next week and so should you! bacon + chocolate = ?